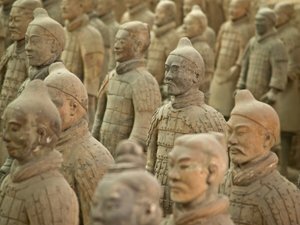 The Terracotta Army was constructed to accompany the tomb of China’s First Emperor as an afterlife guard. 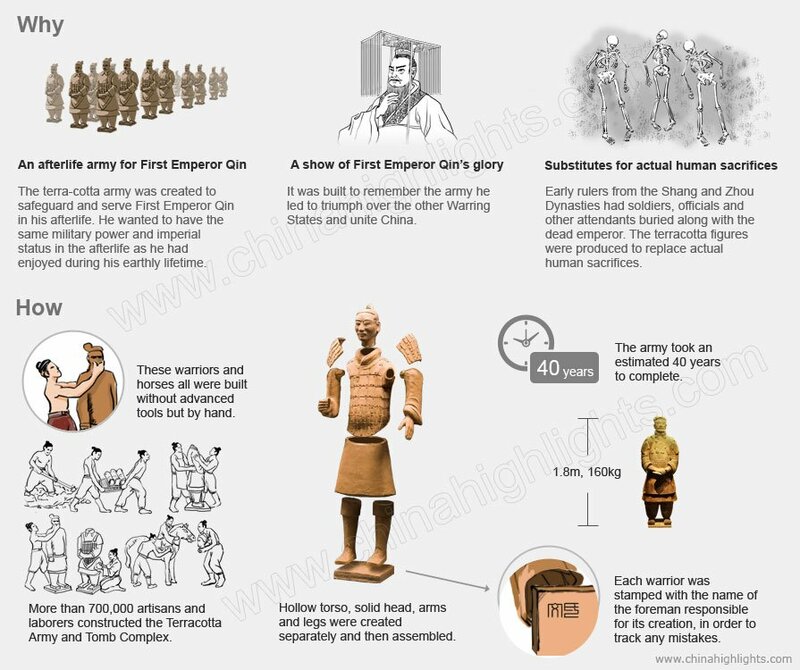 The thousands of detailed life-size models represent the army that united China at the end of the Warring States Period (476–221 BC). They were molded in parts, fired, then assembled and painted. It is considered one of the greatest archaeological sites in the world, and one of the greatest discoveries of the 20th century. 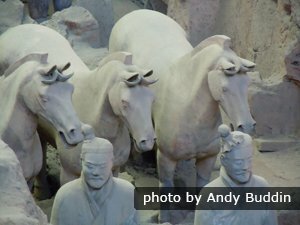 See how to get to the Terracotta Army from Xi&apos;an. Construction: 246–206 BC. With the tomb of Emperor Qin Shihuang it took 720,000 builders. 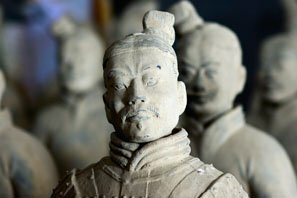 Why and How Were the Terracotta Warriors Made? 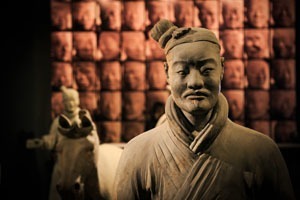 First Emperor Qin (/chin/), from whom China gets its name, ordered the creation of this army of terracotta statues. 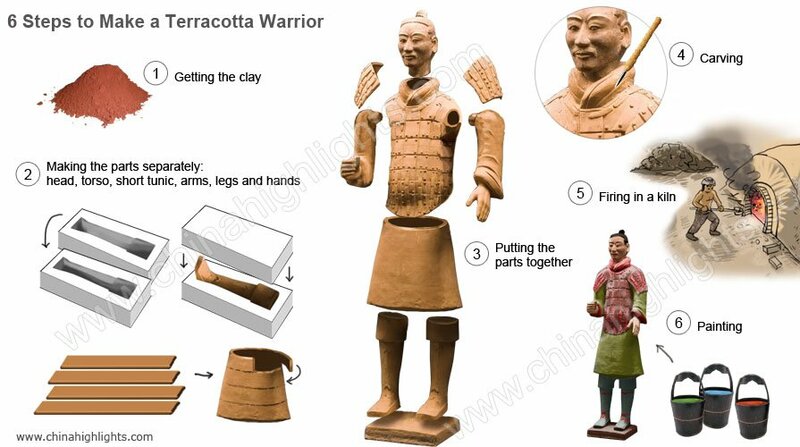 You will find that some terracotta figures are without heads, but their bodies are complete. Studies of their portions have revealed that the heads, arms, and torsos of the figures were created separately and then assembled. It is believed that most warriors&apos; heads and arms were produced in molds as separate modules. After assembly, clay was applied to the surface of the sculptures so that artists could model the faces and hairdos individually. Then, the figures were fired in kilns to make the clay hard and durable. Afterwards, they were painted with bright colors. As a result, every figure looks different and unique, just like real people do. After 2,000 years of erosion and humidity, most figures have lost their original vivid color. 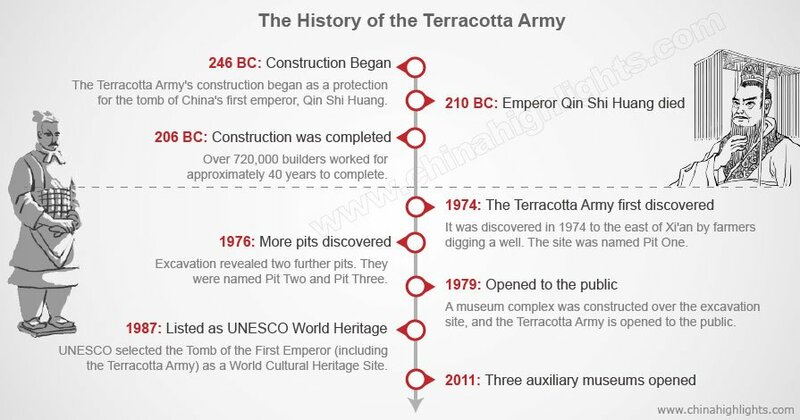 The Terracotta Army figures’ excavation is regarded as one of the greatest discoveries of the 20th century. It had lain underground for more than 2000 years before farmers digging a well in 1974 uncovered what is now considered one of the greatest archaeological sites in the world. 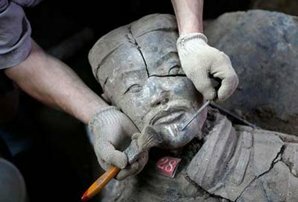 The first part of the Terracotta Army site to be discovered was named Vault One. In 1976, two other vaults were uncovered about 20 meters away, and were named Vault Two and Vault Three. The tomb is a treasury for the Chinese people and for the whole world. In December 1987, UNESCO selected the Tomb of the First Emperor (including the Terracotta Army Vaults) as a World Cultural Heritage Site. The vaults are arrayed as the buried army was in strict accordance with the ancient directives on the Art of War: facing east towards the ancient enemies of Qin State (and towards the entrance), with Vault One on the right flank, Vault Two on the left flank, and Vault Three a command post at the rear. Pit 1 is the largest and most impressive — the size of an airplane hangar. 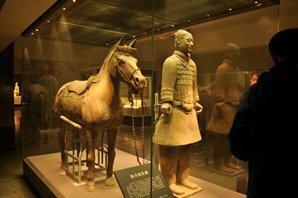 It is believed to contain over 6,000 terracotta figures of soldiers and horses, but less than 2,000 are on display. 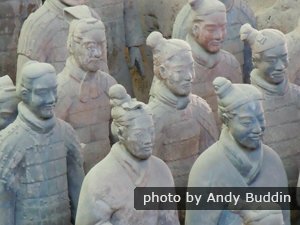 All the most impressive Terracotta Army pictures were taken in Pit 1. All soldiers and horses face east in a rectangular array, each one either armed long spear, dragger or halberd. The vanguard appears to be three rows of infantry who stand at the easternmost end of the army. 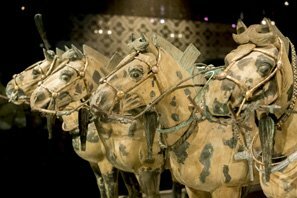 Close behind is the main force of armored soldiers holding weapons, accompanied by 38 horse-driven chariots. On the southern, northern, and western side there stand one row of figures serving as the army&apos;s defense wing. Standing in front of such a grand ancient army array, one would feel the ground shake to the footsteps of the advancing soldiers. Every figure differs in facial features and expression, clothing, hairstyle, and gestures, providing abundant and detailed artifacts for the study of the military, cultural, and economic history of that period. This vault opened to visitors in 1979. It measures about 210 meters long and 62 meters wide and the bottom of the pit varies from 4.5 meters to 6.5 meters below ground level. Ten earthen walls were built at intervals of 2.5 meters, forming 9 circling corridors. Warriors and horses in vault two form a rigorous battle array. Excavation and restoration is still ongoing at vaults two and three. Excavated in 1976, Pit 2 stands about 20 meters north to Pit 1. 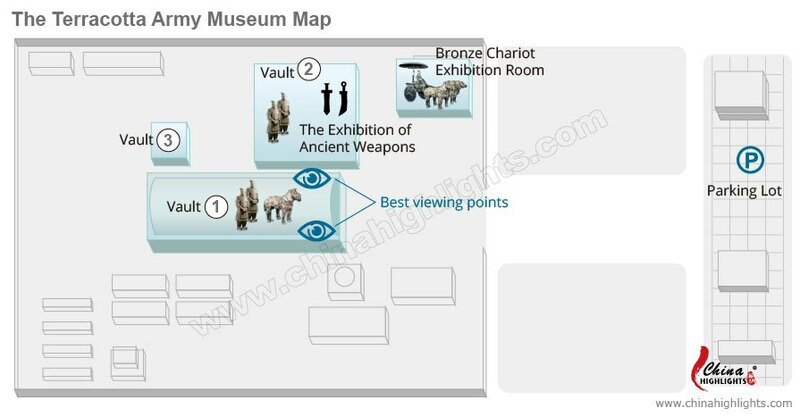 As the highlight of the whole mausoleum, it uncovers the mystery of the ancient army array. It consists of four units, measuring 94 meters east to west and 84 meters south to north and 5 meters deep., forming a 6000 sq. meter built-up area. The first unit contains rows of kneeling and standing archers; the second one is a chariot war array; the third unit consists of mixed forces with infantry, chariot and trooper standing in rectangular array; and the last one includes numerous troopers holding weapons. The four units form a rigorous battle array. Vault Three is the smallest one. There are only 68 terracotta figures, many of which are without heads. It&apos;s obvious that Vault Three represents the command post, as all the figures are officials. 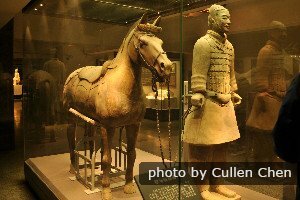 The two bronze carriages displayed in the hall were discovered 20 meters from the west side of the Tomb of Qin Shihuang in December 1980, and were elaborately restored before exhibition. The carriages have about 3,400 parts each and were driven by four horses. The second one is 3.17meters long and 1.06 meters high. The bronze horses vary from 65 cm to 67 cm high and 120 cm long. Each weighs 1,234 kg in total. They were mainly made of bronze, but there were 1,720 pieces of golden and silver ornaments, weighting 7 kg, on each carriage. 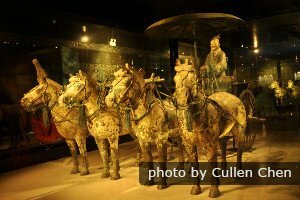 The carriages were so well-made, and so vivid, that they boast being the best-preserved and having the highest rank among the earliest known bronze relics in China. These chariots are the biggest pieces of ancient bronzeware ever found in the world. In the three pits, approximately 8,000 life-size, vivid in battle formation were revealed in the course of excavation — a whole army, which would accompany its emperor into immortality. 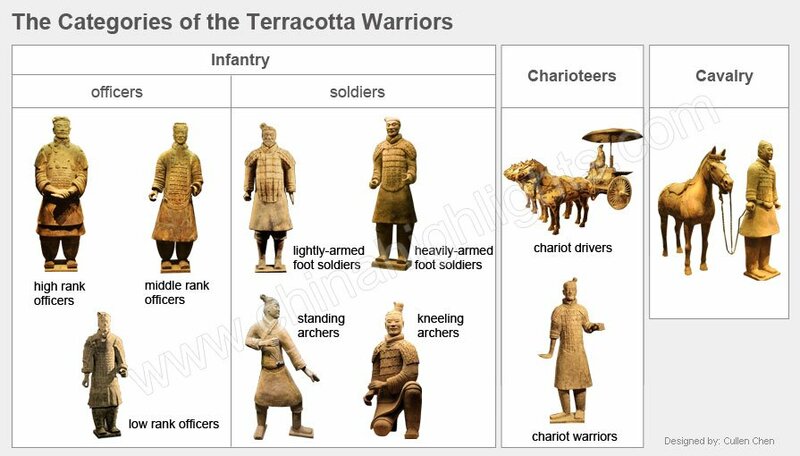 The excavated terracotta figures fall into three major categories: infantry, cavalry, and charioteers. The infantry can be further divided into subcategories, including officers of high, middle, and low rank, light-armed and heavy-armed foot soldiers, and standing and kneeling archers. The charioteers can be further divided into two subcategories: chariot drivers and chariot warriors. Every figure differs in its facial features and expression, clothing, and hairstyle in accordance with its rank. Analyses show that the facial shapes of the terracotta figures can be roughly classified into eight types, and each shape resembles a Chinese character: 目, 国, 用, 甲, 田, 由, 申, and 风. For example, &apos;目&apos;-shaped faces look relatively narrow and long, and have small features. Hairstyles in ancient times were not only part of people&apos;s lifestyles but also a reflection of their social status. 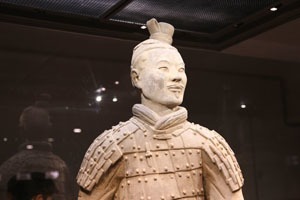 The hairstyles of the terracotta warriors are different based on their ranks and arm of the services. The hairstyles of the figures can be roughly divided into two types. The first type includes figures wearing their hair in a bun on the right side of the head. The other type depicts figures wearing their hair in a plait and forming a bun at the top of the head that was then covered with a cloth cap. Bands, ribbons, or pins were used for typing up their hair. The general wears two layers of robes beneath an armored tunic that protects his chest, back, and shoulders. He wears square-toed shoes, which are lightweight and curve upwards at the front. Only one general was found in Pit 1 and two in Pit 2. Armored warriors wear robes covered by turtleneck, heavily armored capes designed to protect their chests, backs, and shoulders. Cavalrymen wear pillbox hats, neck scarves, and light body armor to the front and back. Their shoes are soft and round at the toes so as not to injure their mounts. Chariot drivers have extra protection for their outstretched arms and hands that need to control the horses’ reigns. They wear helmets to protect the back of their necks. Many of the figures originally held real weapons of the time, such as bronze swords, longbows, arrows, spears, dagger-axes, and other long-shafted weapons. The weapons were treated to make them resistant to rust and corrosion, so that, even after being buried for over 2,000 years, they are still sharp. We have developed some beyond ordinary activities in Xi&apos;an, including to discover a mysterious place to have a close experience with a Terracotta Warrior. Contact us if you want to add these activities to your itinerary. 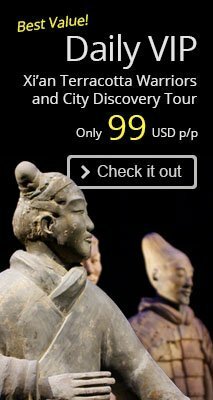 4-Day Xi’an Ancient Relics Tour: Discover more of Xi&apos;an — capital of 13 ancient dynasties — to explore China&apos;s ancient culture. 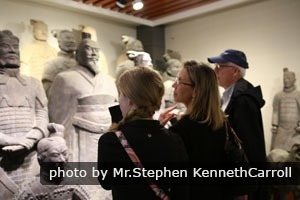 See more our Xi&apos;an tours or contact us to tailor-make a tour to meet your requirements.